If you have ever lived with roommates, battles over the electricity bill are probably old hat to you by now. After all, why should everyone have to pay the same amount if only one person has a hundred different devices constantly plugged in? 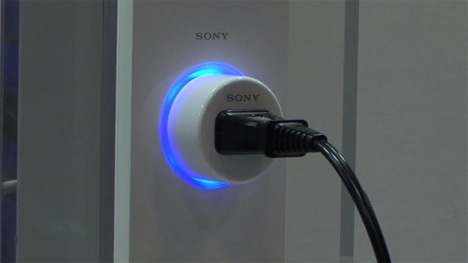 Sony is about to settle those arguments once and for all with a neat new outlet that will be able to identify what device is plugged into it…and to whom it belongs. The system uses a proprietary no-contact RFID chip called FeliCa Lite that will be built into a device’s plug and communicate with a reader/writer unit built into the outlet. The reader/writer unit identifies the device and keeps track of its power consumption. In the case of an emergency or electricity shortage, the outlets will be able to turn off power to non-essential things while keeping more important devices (like healthcare equipment and food storage appliances) powered. The system will also include personal RFID-enabled cards that will be waved over outlets to grant power for a certain amount of time (and presumably for a set amount of money). Administrators of public buildings will utilize the technology to charge people for charging their cars, laptops and phones. Uptight roomies will use it to punish you for leaving every appliance you own plugged in all day and night. There’s no word yet from Sony on when the system will hit the market since appliance and power supply manufacturers would have to be on board first.